The New York Mets on Tuesday introduced newly acquired Robinson Cano and closer Edwin Diaz during a press conference at Citi Field. The blockbuster trade with the Seattle Mariners was made official Monday. "Robinson Cano is one of the best second basemen in the history of the game. He immediately will impact the middle of our lineup and increase the run production in a meaningful and significant way," general manager Brodie Van Wagenen said Tuesday. "Edwin is the best closer in the game today. He will be the anchor of our bullpen, and he will electrify our fan base," Van Wagenen said. "Most importantly, everyone should know that these two players are here to accomplish our goals of winning now and in the future." The players showed off their Mets jerseys; Cano No. 24 and Diaz No. 39. "I came here to win," Diaz said. "To the Mets fans -- we came here to win and try to reach the World Series and get a ring." 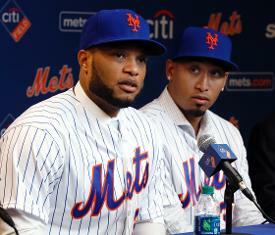 Diaz, 24, is considered the prize of the trade for the Mets. He finished the season with a 1.96 ERA and led the majors with 57 saves in 73 appearances. The Mariners finished 66-0 in games Diaz entered with the lead. Cano, 36, has five years and $120 million left on the 10-year deal he signed with Seattle in 2014. He is coming off a shortened season in 2018, when he was suspended for 80 games for a failed drug test. "I'm happy to be back in New York," Cano said. "I just can't wait for the season to start to be able to go out there and perform and help the team win the World Series." The Mets traded outfielder Jay Bruce, relief pitchers Anthony Swarzak and Gerson Bautista, and former first-round draft picks Jarred Kelenic and Justin Dunn to Seattle. The Mariners included $20 million to put toward Cano's contract. And Van Wagenen assured the gathering that the Mets aren't done yet. "We did not make this move to have this be the last move," Van Wagenen said. "We have talent already on the roster. We want to bolster the team, improve our production next season and add more players around this. That's our mission."